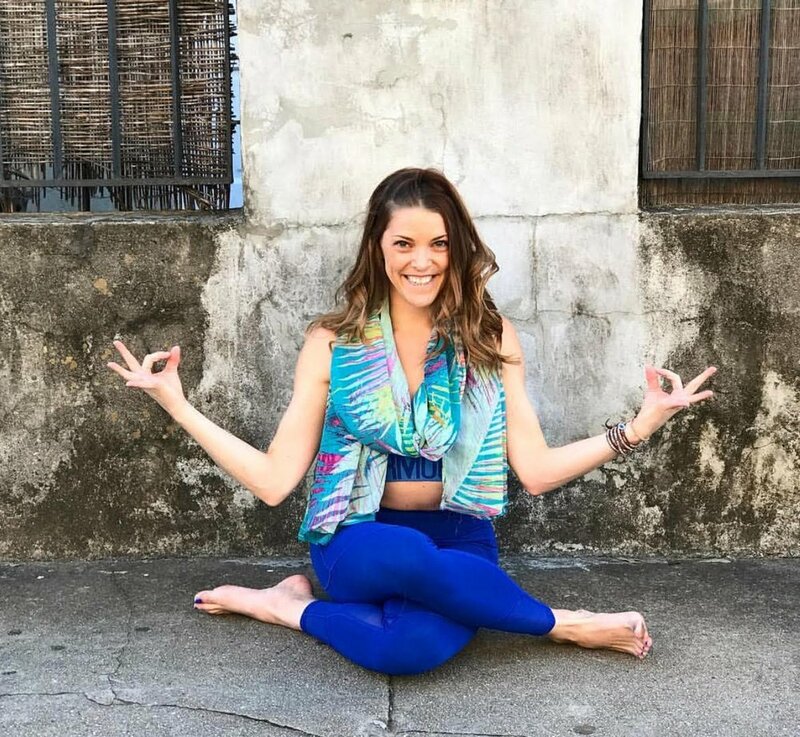 Baye Cobb Tilson, a certified yoga instructor, exercise enthusiast, and New Orleans newlywed, co-founded NOLA Tribe Yoga as an opportunity to share a practice of love, light, and inner peace, especially in times that will fly before your eyes. She has been practicing yoga for over ten years and became certified to begin teaching others three years ago. Baye initially found yoga in high school and practiced here and there as a supplement to other athletic activity. It wasn’t until college, where she studied yoga under a former Buddhist monk, that she sought to understand the deeper purpose of yoga. It became clear that yoga is more than breath (pranayama) and movement (asana). To Baye, yoga is the path to realizing, becoming, and living, as your truest, most authentic and most present self. Yoga is the process of seeking peace in the present, truth in unknown, and love in challenge. Baye loves yoga and sharing a fast, fun, funky vinyasa flow that moves you, from your head, to your hips, to your heart. Our yoga sessions are carefully crafted to meet your group’s goals and skill levels. Baye’s classes can be restorative and Baye’s classes can be meditative, but if she had a preference, Baye’s classes are energetic and fun. Her personality is hard to contain and we’re all better off if she gets to express it. A typical class will consist of a high energy flow to music which crescendos to a mix of challenging balancing poses and core exercises that will increase your heart rate and challenge you mentally and physically. You’ll then move into strength and stretching during relaxing mat work and ending in a yoga-stoned savasana. While we flow as a community, yoga is a personal practice, and we believe in making it a practice that serves you. Whether it’s a special theme or focus area, we’re all about making this practice all about you! Follow Baye on Instagram here! To be a lover of New Orleans, you have to be a lover of life. McKensie is a born and raised Nebraskan who bleeds Husker Red. Yet she’s been caught up in a love affair with New Orleans for nearly a decade. This immense love for New Orleans has led her to hold herself personally accountable if anyone visits and leaves without a similar feeling of enjoyment/success/euphoria. That’s much of the reason why she co-founded this company. McKensie wants to strengthen the ideals of simplicity, mindfulness and peace which are so easily lost in the daily hustle. When you hold these concepts close, you can return to this innate happiness that we all so desperately crave and together, achieve a beautiful New Orleans that’s better than ever. Follow McKensie on Instagram here! As our tribe has grown (beyond our wildest dreams) so has our list of B.A. instructors to lead it! Our team is as diverse in their style of flow as they are in the city they originate from; yet each of them hold true to the tribe's values of offering an engaging, powerful flow while promoting a new connection to your inner self and your fellow New Orleanians. A Texan by blood, Kaitlyn made New Orleans her home and became a part of the yoga community in 2016 after receiving her certification in Thailand. Her classes are as fun as they are unique. Every practice is a new flow. Once an intention has been set, she guides her students through pranayama techniques that weave into creative transitions throughout the asana, ending practice with a deep meditation. Her style includes Vinyasa, Yin, and a background in Ashtanga. Along with leading adults, Kaitlyn is in her third year with Project Peaceful Warriors, a local nonprofit that brings mindfulness and movement to New Orleans youth. Weekly NTY classes on a rotating basis. Follow Kaitlyn on Instagram here! Originally from Los Angeles, Zoë is a tri-coast girl! She grew up on the West Coast, lived on the East Coast for several years, before settling down here on the Gulf Coast. She earned her 200 RYT certification in 2017 from Free To Be Power yoga and specializes in Baptiste Yoga. Currently, she teaches and manages at the studio she did her teacher training and teaches with us! Her passion lies in bringing health and wellness to communities which need it the most, and is constantly on the look out for how better to serve the community around her. She believes in a good sense of humor, that yoga doesn't have to be taken so seriously, and that access wellness opportunities is everyone's right. Her training beyond her 200 RYT include the Baptiste Power Teacher Course and is a certified Baptiste Instructor. Follow Zoë on Instagram here! - Weekly NTY classes on a rotating basis. Follow Meg on Instagram here! Becca received her 200-hour yoga teacher certification from Yogaview in Chicago. She initially turned to yoga for a low impact form of exercise after a sports-related knee injury. However, she soon discovered the mental and emotional benefits of yoga the more she practiced leading to a calmness and inner peace, which she takes into all aspects of her life. Becca incorporates Vinyasa and Hatha postures into her classes with Bikram and Ashtanga influences.